Gourmet du Village introduces its new homemade soups, the perfect comfort food for the upcoming winter season. Three delicious flavors, Barley Vegetable, Split Pea and Lentil Curry, are each made with natural ingredients using easy to follow recipes and directions, resulting in traditional-tasting, county-style warming soups. 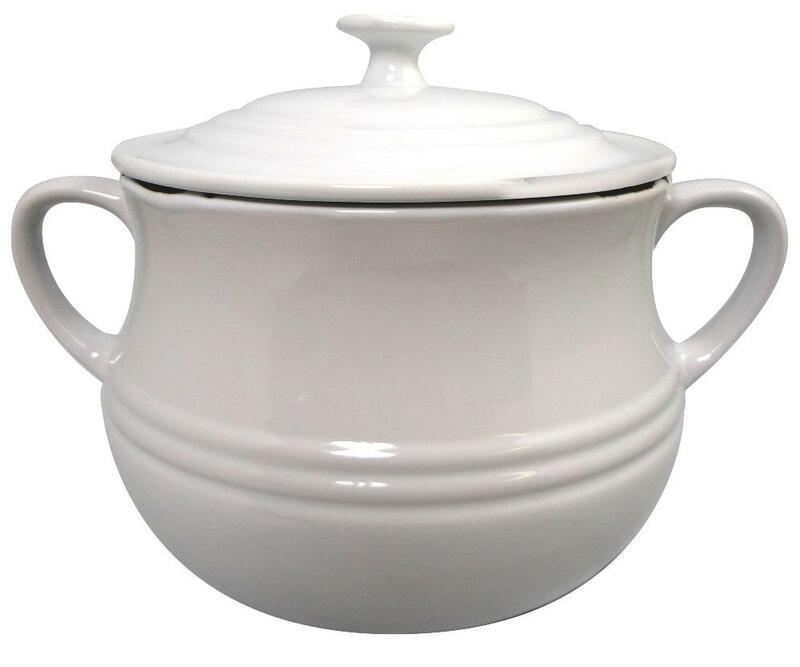 Enhance your presentation at the table by serving the soups in the new Gourmet du Village classic-style soup tureen. These new products along with the entire new collection of Gourmet du Village gifts can be seen at showrooms in Dallas, Atlanta, Philadelphia, and at the Winter Fancy Food Show in San Francisco. This entry was posted in Healthy Choices, Prepared Meals, Trade shows, Uncategorized and tagged Gourmet du Village, soups on October 18, 2013 by lorrieb2013. Roland® Extra Virgin Olive Oil packed in Italy has received the North American Olive Oil Association (NAOOA) Certified Quality Seal. Roland® Extra Virgin Olive Oil is packed in Italy and has a perfect green-gold color, clean aroma, and smooth flavor. The NAOOA Seal indicates a high quality olive oil that is frequently tested by a sensory panel and meets even more rigorous standards than what is required by the United States government. To receive the seal, samples of Roland Extra Virgin Olive Oil are taken directly from the marketplace for analysis. Receiving the seal indicates that the product tested meets or exceeds the International Olive Council (IOC) standards. For more than 50 years, the IOC has been recognized as the worldwide quality-standard-setting body for the olive oil industry and its standard is the basis for the newly implemented USDA standard. This entry was posted in Oils and tagged olive oil, Roland Foods on October 18, 2013 by lorrieb2013. 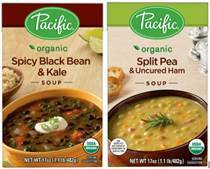 This month, Pacific Foods is adding Organic Spicy Black Bean & Kale and Organic Split Pea & Uncured Ham to its existing line of more than 20 ready-to-eat hearty soup varieties. The new offerings are made exclusively with organic, non-GMO ingredients, providing families with two new flavorful and nutritious mealtime options – perfect for busy weeknights. Joining the kale movement, Pacific gives the leafy green superfood a spicy kick with just the right mix of seasonings, including a dash of garlic, sea salt and chili peppers, to create a satiating soup. Combining fresh organic vegetables, including iron- and antioxidant-rich kale, tomatoes, celery, carrots and onions with protein- and fiber-rich black beans, Pacific’s new hearty soup is a nutritional powerhouse. Fat-free and vegan-friendly, it is a great option to keep on-hand during the hectic back-to-school season – just heat and serve, pour over grains, or top with a dollop of sour cream. The smooth, delicate flavor of organic peas, accentuated with a dash of sea salt and savory uncured ham revitalizes this cookbook staple, appealing to modern consumers. The only USDA organic split pea and ham soup on the market, Pacific’s version of this classic comfort food stays true to the authentic recipe while updating the soup with premium ingredients including organic peas, carrots, and onions and chef-inspired seasonings. The ham is certified organic, uncured and sourced from family farms that do not use antibiotics or feed grown with synthetic pesticides or fertilizers. The soup is an excellent source of fiber and protein – one serving contains 10 g of fiber, 40 percent of the recommended daily intake, and 11 g of protein. Ensuring the integrity of the ingredients found in both of the these new recipes, and all of its products, Pacific’s Certified to the Source program tracks the origin and history of each ingredient to verify quality, and safety and provide the best taste possible. The soups are packaged in recyclable, easy-to-open, BPA-free Tetra Recart cartons that seal in freshness – a great alternative to cans that lends to better flavor and a smaller carbon footprint. Both varieties are currently available at grocery and natural food stores nationwide (SRP $3.19 – $3.89 for 17 ounces). This entry was posted in Healthy Choices, Prepared Meals and tagged Pacific Foods, soups on October 18, 2013 by lorrieb2013. Quiche has made the perfect meal centerpiece for hundreds of years, and now La Terra Fina is making it easy to enjoy this savory dish by merely heating it in the oven. The company, which has been creating delicious, chef-inspired food for 30 years, debuts a line of 23-ounce gourmet quiches with three popular flavors that taste like you made them at home. Quiche Lorraine: A truly classic quiche made from a tantalizing blend of bacon and Swiss cheese in an egg white custard, this popular quiche is perfect for serving to guests or enjoying on your own. 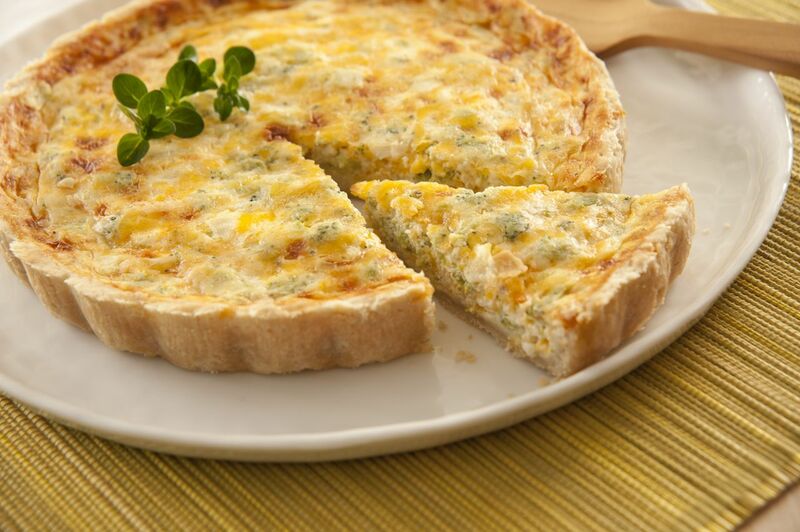 Cheesy Broccoli Quiche: A delicious blend of all natural cheddar cheese mingled with chunks of broccoli florets in an egg white custard filling makes this well-loved quiche a comfort food favorite. Spinach & Artichoke Florentine: Sumptuous cheeses combine with natural spinach and artichoke in egg white custard makes this tasty quiche a true delight that is always a crowd pleaser. La Terra Fina quiches are available immediately to retailers in single packages for the suggested retail price of $8.99 – $9.99. Founded in 1983 by a popular San Francisco Bay Area caterer, La Terra Fina now produces products in a state-of-the-art, 60,000-square-foot food processing facility, still located in the rich food culture of the Bay Area. La Terra Fina, meaning “the good earth” in Italian, produces a wide range of all-natural, ready-to-eat refrigerated quiches and dips rich in flavor and high in quality. La Terra Fina products are sold in supermarkets, club stores and specialty grocery retailers nationwide. For more information, visit www.laterrafina.com or http://www.facebook.com/LaTerraFina. This entry was posted in Healthy Choices, Prepared Meals and tagged La Terra Fina, quiche on October 18, 2013 by lorrieb2013. Sift dry ingredients together in a large mixing bowl. In a separate bowl, mix together pumpkin, water, oil and eggs. Pour liquids mixture into dry ingredients and mix together well. Spray 2 loaf pans with non-stick spray. Pour finished mixture into loaf pans. Bake at 350 degrees F for about an hour and 15 minutes. 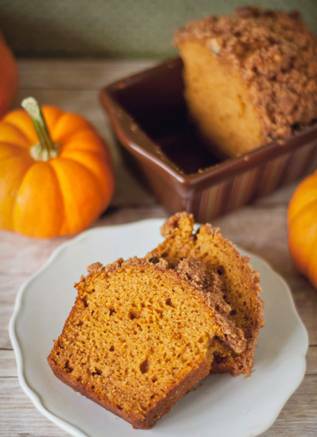 Pumpkin bread is done when top is brown and an inserted toothpick comes out dry. This entry was posted in Bakery, Oils and tagged Carrington Farms, coconut oil, pumpkin bread, recipes on October 15, 2013 by lorrieb2013. Ramen, one of the best-loved Asian foods and a shelf staple in millions of American kitchens, dorm rooms and offices, is about to become even more popular. Traditionally, ramen noodles are made from wheat, and thus off-bounds to ­­legions of consumers who are gluten intolerant. Lotus Foods, who changed how Americans think about rice, is shaking up the ramen world, introducing traditional Japanese-style ramen noodles made from rice. Lotus Foods ‘ready-in-four-minutes’ Ramen are available in three flavors: Forbidden Rice® Ramen; Jade Pearl Rice™ Ramen; and Millet & Brown Rice Ramen. Consumers will have a choice of buying individual ramen cakes with savory reduced-sodium miso soup flavor packets to make an instant bowl of nourishing noodle soup, or four ramen noodle cakes packaged together without any flavor packets. Lotus Foods Ramen are perfect as a snack or the start of a complete meal by adding vegetables or a protein of choice. They will add drama to your favorite stir-fry or transform your classic cold noodle salad with a simple soy sauce and sesame dressing. Forbidden Rice® Ramen are a natural source of antioxidants and high in protein, fiber and minerals. Jade Pearl Rice™ Ramen is infused with chlorophyll-rich, wild-crafted bamboo extract for enhanced taste and nutrition. Millet & Brown Rice Ramen have a delicious nutty taste and are a good source of fiber and protein. 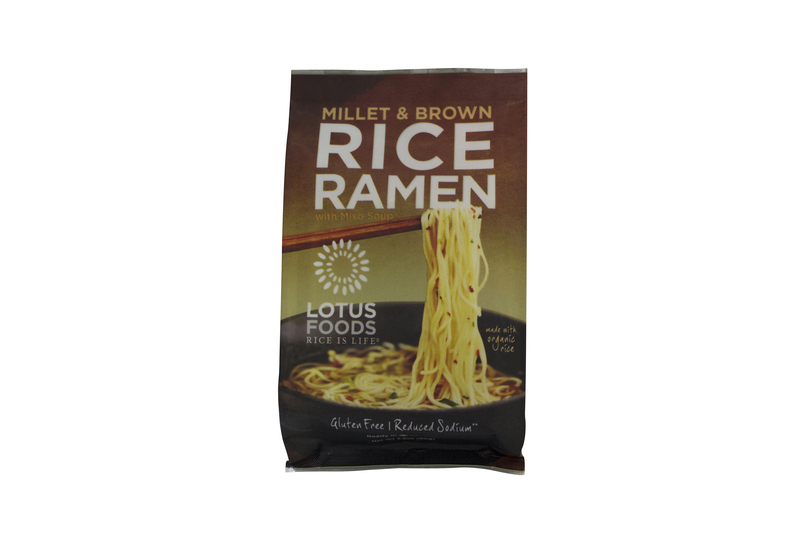 As well as being gluten free, low fat and vegan, Lotus Foods Rice Ramen are made with organic rice and all non-GMO ingredients. The miso soup packets have 25 to 33 percent less sodium than regular ramen soups. This is the second new product launch by Lotus Foods this year. In the spring, the company launched convenient microwaveable Heat & Eat Rice Bowls. Ready in just 90 seconds, they deliver nutritional benefits with three great-tasting heirloom rices. All three rices are produced through Lotus Foods’ partnership with family rice farmers in Cambodia and Indonesia, who are using water-conserving More Crop Per Drop™ growing methods. All of the products are gluten free, non-GMO verified and with no added salt or fat. Like the new Lotus Foods Rice Ramen, the bowls can be the easy, instant start to a complete meal or a quick, healthy snack. Since 1995, Lotus Foods has been sourcing fair-trade ingredients from small family farmers around the world who are growing rice sustainably and preserving heirloom and specialty rices. The company’s objective is not only to help rice farmers earn a living wage but to bring healthier rice choices to consumers. This entry was posted in Grains & Flours, Healthy Choices, Prepared Meals, Vegetarian and tagged gluten-free, Heat & Eat Rice Bowls, Lotus Foods, Rice Ramen on October 14, 2013 by lorrieb2013. Carrington Co., LLC is the maker of organic, non-genetically modified products including flax seeds, hemp, chia, organic coconut oil and teas. Today, the company is excited to announce the addition of “Carrington Organics” to the existing roster of high quality health foods, launching the first-ever tea to feature 100 percent eco-friendly packaging that will fully and safely biodegrade when composted. The new Carrington Organics Tea line is offered in three great flavors including Chamomile, Soothing Herbal and Green Tea Lemon. Carrington Organics teas contain 20 tea bags per package and are available for purchase (MSRP $3.99) at Wal-Mart, select grocery stores and online. All Carrington Organics tea products are organic-certified and packed in the United States. For more information, visit www.CarringtonTea.com, www.facebook.com/CarringtonFarms or www.twitter.com/CarringtonFarms. This entry was posted in Branding & Packaging, Tea and tagged Carrington, compostable on October 14, 2013 by lorrieb2013. Founded in 1931 in Venice by Giuseppe Cipriani, the mythical Harry’s Bar is world-renowned for its Italian simplicity and sophistication. Originally opened as a bar, it was transformed into a restaurant and went on to welcome some of the most legendary names in cinema, literature, the arts, and more, from Ernest Hemingway, Charlie Chaplin, and Truman Capote to Barbara Hutton, Peggy Guggenheim, and Woody Allen. The fabled establishment is also known for having served as the birthplace of the Bellini cocktail and carpaccio. 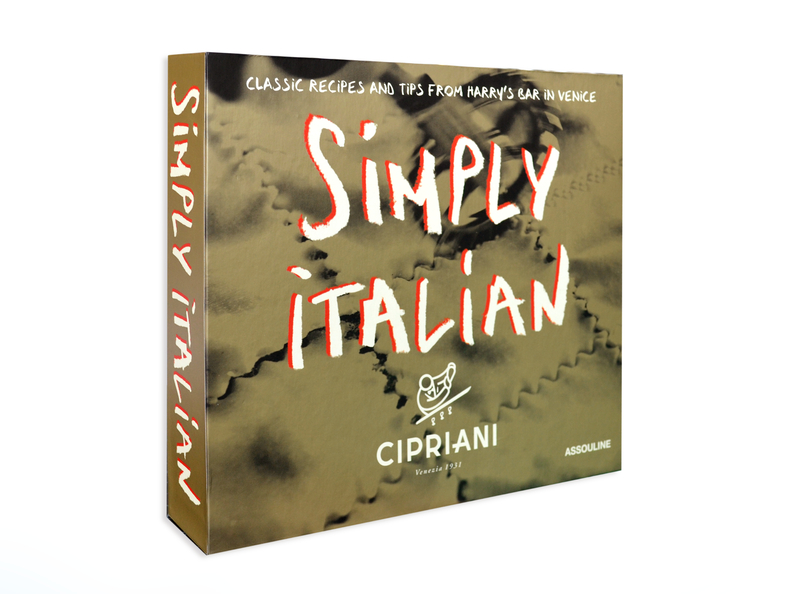 Simply Italian offers recipes and tips from Arrigo Cipriani—Giuseppe’s son and the restaurant’s owner—to make simple yet delicious Italian dishes from Harry’s menu. From tiramisu and minestrone soup to pappardelle ai funghi and risotto alla parmigiana, this title is the best accessory for lovers of Italian cuisine. This entry was posted in Uncategorized and tagged Cipriani, cookbook on October 14, 2013 by lorrieb2013. 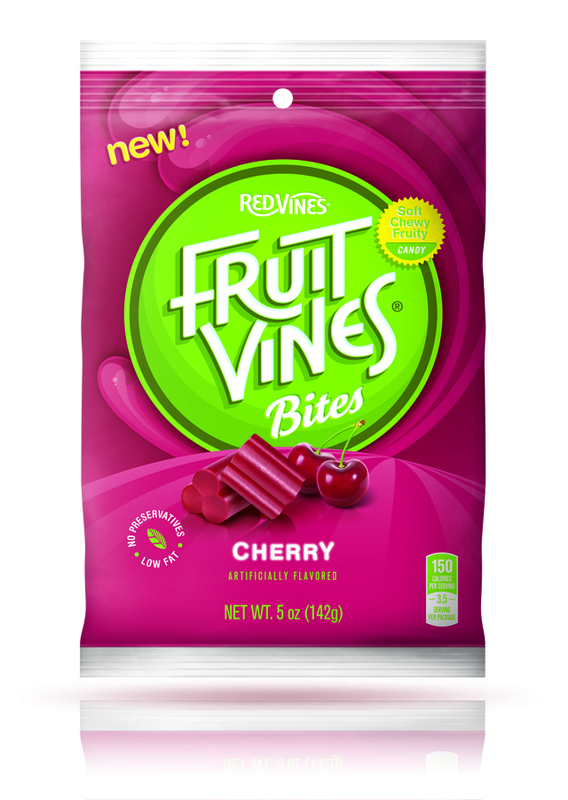 American Licorice Company has announced the launch launch of Fruit Vines® Bites – soft, chewy bite size candy packed with delicious fruit flavors designed to give everyone a new candy experience. 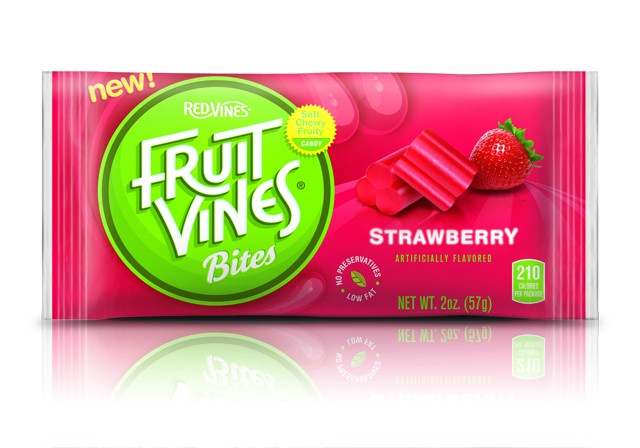 Fruit Vines Bites will give consumers a soft, chewy on-the-go snack when the product hits store shelves in early 2014. The bite size pieces will be available in popular Strawberry and Cherry fruit flavors. Support for the Fruit Vines launch will include an integrated media campaign, featuring a :30 national cable commercial, mobile sampling tour, a national FSI, digital and mobile integration, and multi-platform sponsorships to engage consumers with the brand. Low fat and containing no preservatives, Fruit Vines Bites will be available in three sizes: 2-ounce count, 5-ounce hanging bag and 10-ounce stand-up bag. This entry was posted in Confections and tagged American Licorice Company, Fruit Vines Bites on October 12, 2013 by lorrieb2013. Oh, this is fun! 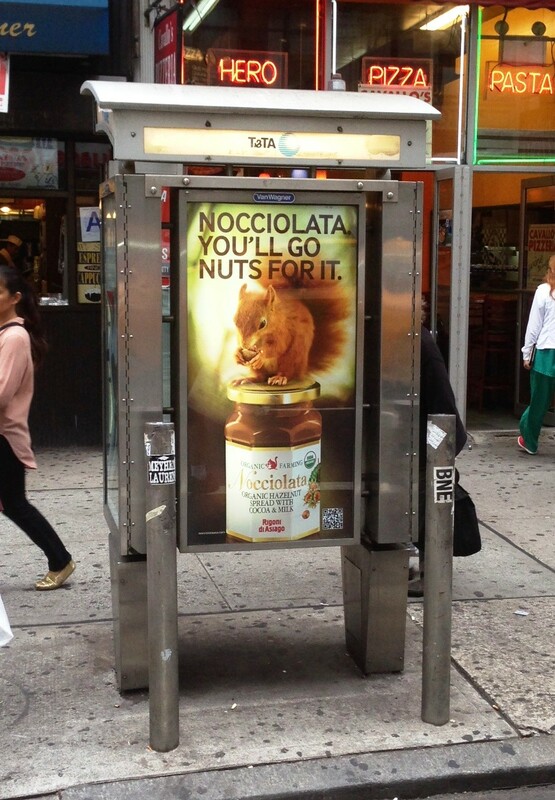 Rigoni di Asiago has launched an ad campaign for Nocciolata organic hazelnut spread on telephone kiosks around the heart of Manhattan in New York City. Just look! How could you pass that without smiling? Nocciolata, from Rigoni di Asiago, is 100 percent natural and made only of organic raw ingredients without the use of chemical processes and does not contain artificial flavors, which could alter its taste. Soft and scented with the flavor of Italian hazelnuts, Nocciolata is a step above any other brand of his category. 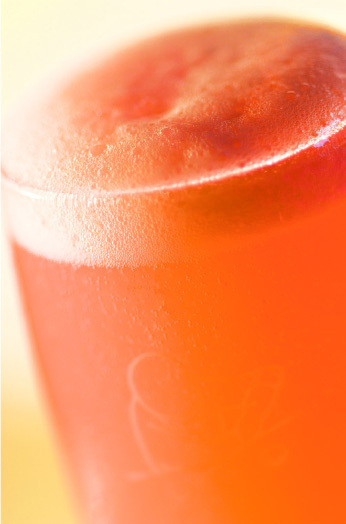 Ingredients are carefully selected, measured and skillfully combined to create the perfect, creamy consistency. Nocciolata needs 36 hours of artisan processing for a creamier and softer texture. With no trans-fat and no palm oil, Nocciolata is gluten free and the perfect source for calcium and phosphorus. It can be enjoyed as a spread on bread, an accompaniment to cakes, crepes or ice cream and it is even used by creative chefs around the U.S. for cooking and baking. Nocciolata was selected as a 2010 sofi ™ Awards Silver Finalist in the Outstanding Jam, Preserve, Honey or Nut Butter category by the National Association for the Specialty Food Trade, Inc. (NASFT), now the Specialty Food Association. Nocciolata is available at Whole Foods Market, Fairway, Gristedes, Food Emporium, D’Agostino and many others independent stores in Manhattan. Around the U.S. it is available in the best natural chain stores. For more information please visit the brand new web site www.nocciolatausa.com. Also watch out for “LIVE SAMPLING” of Nocciolata pouches in selected locations around Manhattan during the weeks of October 27 and November 4. For more information on these events, check the Facebook page at http://www.facebook.com/NocciolataUSA. This entry was posted in Confections and tagged Nocciolata, Rigoni di Asiago on October 11, 2013 by lorrieb2013. 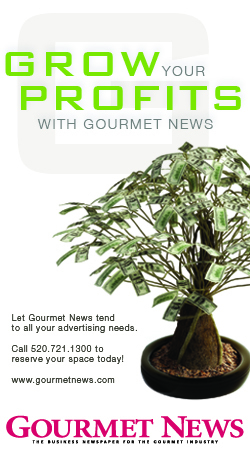 Call 520.721.1300 to advertise here.